Transition Mar Vista/Venice returns to the Green Tent at the Mar Vista Farmers Market! 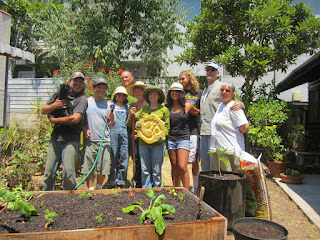 Visit us to learn about Good Karma Gardens, the pay-it-forward program to help people establish edible gardens. Whether you live in an apartment or home, rent or own, have a yard or patio or balcony, Transition Mar Vista/Venice welcomes all comers, providing free guidance and help to participants who are willing to show up for each other and learn. 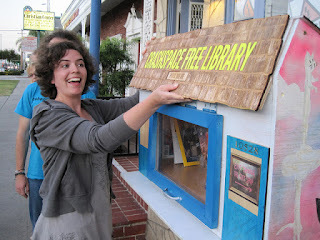 Curious to find out what a Little Free Library is? Come see a cool example of this weather-proof box you can install outside and fill with books to share, and learn how you can build your own or join a group that's making them. Little Free Library's goal is to promote literacy and reading as well as build a sense of community. When you stop by, be sure to talk to Kevin Rudy about his DIY solar panels workshop. It covers how to put together a personal solar panel and provides resources for finding materials. Maybe you'll learn how to power a light for your Little Free Library! LOCATION: Grand View Blvd. @ Venice Blvd.